Our Chalet suites are 4' x 6' on the inside with a sliding door that leads to their private 4' x 12' outdoor run. 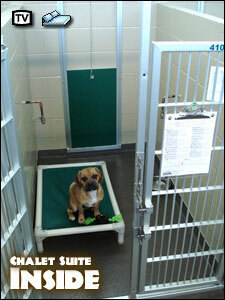 There are 12 of these suites and they are reserved for small dogs that prefer the company of other small dogs. This area tends to be quieter than the Standard suites since there are fewer dogs. There are shared televisions on the walls where the dogs enjoy movies from Beethoven to Lady & The Tramp. A raised, chew–resistant Kuranda bed is included each of these suites, but if you'd like to bring in bedding from home as well, you're always welcome. 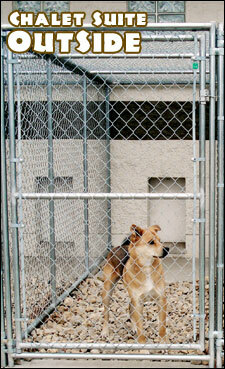 We feel that it eases your dog's transition to our place if they have something that smells like home. Please try to make it machine washable so we can clean it in case of an accident, and no irreplaceable items, please.